This is a Sherman V of A Squadron, 19th King George’s Own Lancers photographed in Burma in early 1945. From late 1944 the Lancers were detached from 50th Tank Brigade and trained to take part in amphibious operations, A Squadron being fitted out with deep wading equipment as shown here. 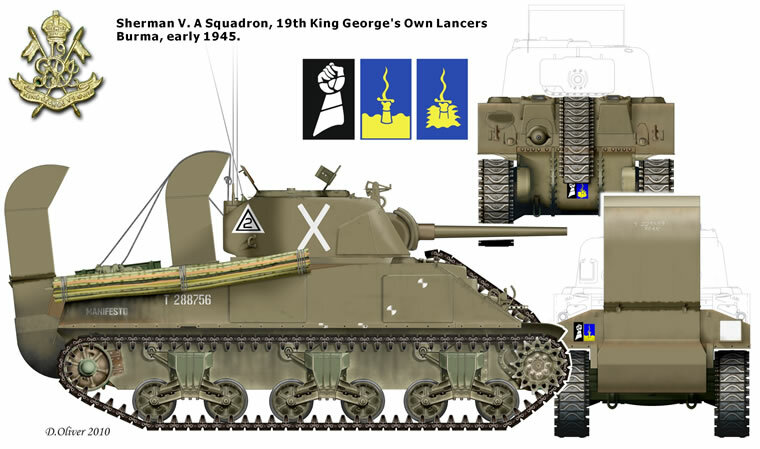 The badge worn alongside 50th Tank Brigade’s mailed fist appears to have been rendered in two versions and the rendering of both are based on clear photographs. The colours are however completely conjectural. Filmed during a landing (possibly at Myebon in January 1945), some tanks had large crosses painted onto the turret sides and although the exact significance of this marking is uncertain. The extra wireless aerials would suggest that they may indicate troop commanders. All the Lancer’s Shermans carried the bamboo fascines shown here and the calibration markings painted onto the hull sides. The latter were used to bore-sight the regiment’s guns.